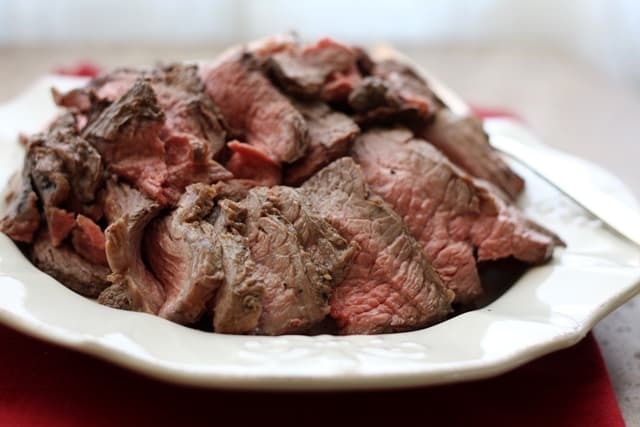 Did you know it is possible to cook perfectly sliceable and tender roast beef in the crock-pot? (In just a couple of hours?!) I’ve been using my crockpot to cook fall-apart tender shredded roasts for years, as proven by two of our favorite roast beef recipes. However, it never before crossed my mind to try a method for slow cooker roast beef like this. I originally planned to cook this roast using my favorite oven method. However, at the last moment, I decided to try improvising that method for the crockpot. It worked great and the roast was a huge hit. 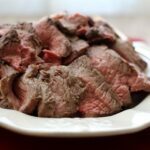 It’s amazingly easy to make roast beef in the crock-pot and didn’t take nearly as long as I expected. From start to finish the whole thing to less than two hours. After searing the meat stove-top with a generous amount of salt and pepper, I put it in the slow cooker on low. Since it was the first time I’d followed this crock pot method I wasn’t sure how long it would take. Times like this are when I’m especially thankful to have a meat thermometer with an alarm! Instead of having to check the roast frequently for doneness, I simply put the meat thermometer in and got busy with other tasks. A beep from the thermometer after 90 minutes told me the internal temperature had reached our ideal 140 degrees. We like our beef closer to rare than well and usually closer to rare than medium. If you prefer yours a bit less pink, adjust the cooking time and final temperature accordingly. It was hard to resist diving into the tender juicy roast right away but we managed to hold off long enough to let the meat rest before slicing it thinly. I served the roast with roasted potatoes and roasted broccoli and the whole family gave the meal great reviews. I served the remaining beef with soft rolls for roast beef sandwiches a couple nights later. It was delicious both ways. Leftovers are also delicious served on a tray of cold cuts, tossed into a salad or fried up with hash. There are so many uses for leftover roast beef that you’ll never be sorry to have extra. The only trick to this meal is slicing the meat as thinly as possible. To accomplish this, use the sharpest knife possible and a meat fork to hold the roast in place as you carve. Carve thin and even slices moving across the grain. Be sure to let the roast beef rest for 10 to 15 minutes to allow the meat to reabsorb all the juices released during cooking. This also makes the beef easier to slice as it cools. I enjoy the no-frills nature of this easy crockpot roast beef recipe While I love showstopping elaborate dinners as much as the next girl, sometimes the simple meals are the best. If you feel like jazzing up your slow cooked roast a little without any extra work, check out Slow Cooker Italian Red Wine Roast Beef. It takes a little more time to make that crock-pot roast, which is flavored with Italian herbs and rich red wine, but it’s well worth it. You skip the searing step of my plan crock-pot roast beef recipe and leave the roast in the crockpot to cook in that delicious red wine marinade for 8-10 hours. To make up for that extra cooking time, this roast rewards you by filling your home with an incredible aromas as it cooks. For something a little different, this Crock Pot Coca-Cola Roast looks tasty too. The soda is used to sweeten and caramelize the meat as it cooks while adding moisture. While it’s not a slow-cooker recipe, while you’re on a roast beef kick you MUST try our favorite Southwestern Roast Beef. The roast is rubbed with a fire-y blend of New Mexico spices and sweet honey; it’s in frequent rotation for dinner at our house. Looking for more fuss free dinner ideas for the slow cooker? You might also enjoy Crock-Pot Chicken Fajitas, Crock-Pot Balsamic Brown Sugar Pork Roast and Crock-Pot Mexican Pork. 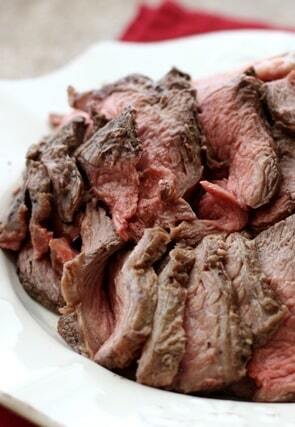 Have you ever tried making roast beef in the slow cooker? Let me know how it turned out then give this recipe a try. You’ll end up with a plate full of flavorful and juicy roast beef that’s so tender it’ll almost fall apart on your fork. I can’t recommend this slow cooker roast beef highly enough! Kitchen Tip: I use this crock-pot and this thermometer to make this recipe. Perfectly sliceable and tender roast beef made in the slow-cooker. Heat the oil in a heavy skillet over medium heat. Season the roast generously with salt and pepper. Sear the meat in the hot skillet, about 3-4 minutes on each side, until the meat has browned. Sear the sides as well as the top and bottom of the roast. Remove from the skillet and place in the crock-pot. Insert an oven-safe meat thermometer into the center of the roast and place the lid on the crockpot. Cook the roast on LOW until the temperature reaches 140 degrees. This took just 90 MINUTES for my roast. Depending on the temperature of your house and how hot your slow cooker cooks, it might take twice as long for yours. I set the alarm on my meat thermometer and couldn't believe it when it beeped so quickly! 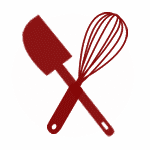 Using meat forks or sturdy tongs, remove the roast to a cutting board and tent it (or cover it with a large mixing bowl turned upside down). Let the meat rest 20 minutes before slicing it as thinly as possible against the grain of the meat. Enjoy! This recipe was excellent. My crockpot cooks at a higher temperature (on high) than it should so it was ready in less than 5 hours. The Worcestershire sauce was a bit too much for my husband so I will half it next time and just add extra to my dish. Awesome comfort food! I loved This! So fast and easy for a crock pot! I added a can of beefy mushroom soup mix to juice and made awesome au jus!, Thank you for sharing! Thank you so much for this recipe. I have made it several times, in fact evertime I make Roast Beef this is the only recipe I use. My family loves it too.